Bluestone Colors | Johnston & Rhodes Bluestone, Co. | East Branch, NY | Johnston & Rhodes Bluestone Co. 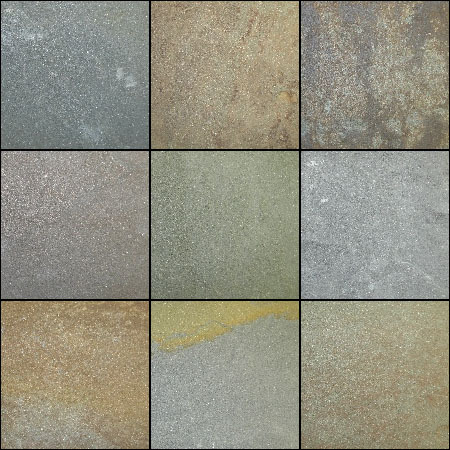 The images below show the approximate full color range for New York natural cleft bluestone. Certain color selections are available; however, it is impossible to choose one, singular color in natural cleft. Please allow for slight differences in tone, hue, and shade. These variances occur naturally within the quarry, and make each individual stone unique. Typically, the three color select categories are blue/blue, brown/green, and blue/gray/green. Blue/blue range is exclusively solid blues and grays. Brown/green range eliminates all blues, grays, and lilacs. Blue/gray/green range excludes lilacs and heavy surface colors, such as gunmetal (purple), deep browns, and golds.